Standing on Biltmore Estate’s grand veranda, perched on a bluff overlooking the jagged peaks of the Blue Ridge to the north and west, it’s easy to understand why steamship and railroad magnate George Vanderbilt wanted to build his Asheville castle here. Sweeping, golden grasslands slope gently down to the French Broad River, and lush forests cling to the hillsides. Vanderbilt tamed this piece of wild Appalachia with his 250-room French Renaissance chateau, along with meticulously manicured gardens, caretakers homes, pastures, farmlands, and a dairy operation, creating a small village to host lavish, turn-of-the-century retreats for friends and family. In Vanderbilt’s day, afternoon tea, banquets, and formal balls were the norm. 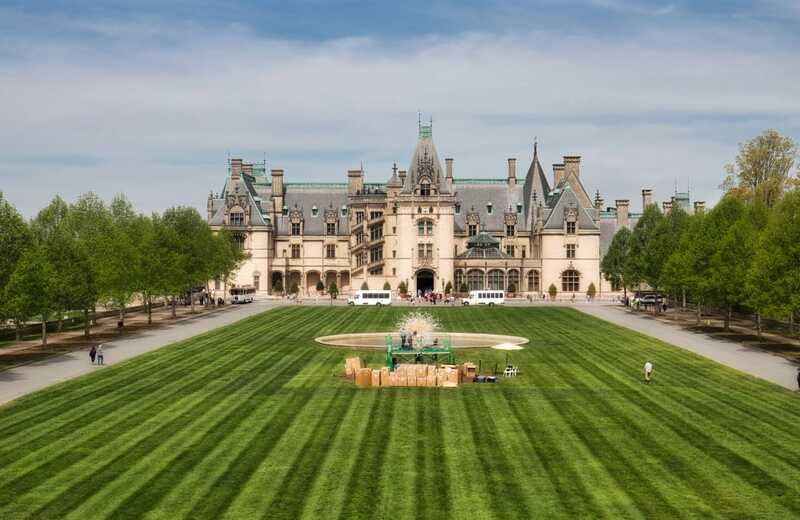 But, Biltmore always had a wild side, too. The Vanderbilts camped and fished in the area, using a group of rustic lodges they built deep in the Pisgah mountains. His eclectic mix of luxury and adventure continues today, with guests starting their day off mountain biking the estate singletrack and climbing the switchbacks to Looking Glass Rock, then winding down with a cocktail in the library lounge or a massage at the resort spa. Plan your getaway to Biltmore Estate for a weekend that combines Victorian-era hospitality with some of the best hiking, biking, and paddling in Asheville. 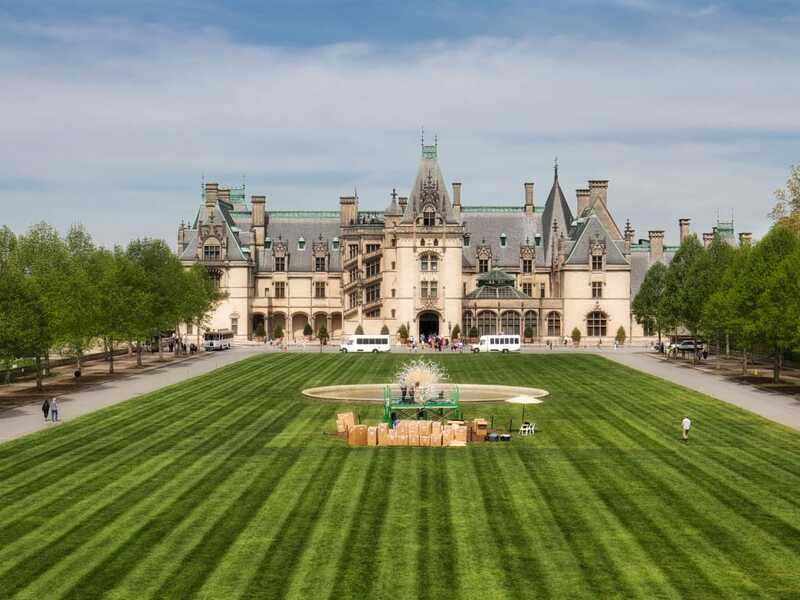 Following his first visit to the area in 1888, it took Vanderbilt six years to build his western North Carolina estate. The project took 1,000 workers who hauled elaborate materials like Italian marble to the site from the railroad depot 3 miles away. He opened the estate to guests on Christmas Eve 1895, married two years later, and lived here with his wife and son until his death in 1914. The house opened for public tours in 1930. You can take a two-hour audio tour of the house and gardens to get a glimpse of what it was like to be a guest of the Vanderbilts during the early years. The main house has an astounding four acres of interior space, with 35 bedrooms, 43 bathrooms, and 65 fireplaces. American landscape architect Frederick Law Olmsted designed the formal gardens, and a dairy barn served as a community center for the large workforce responsible for managing the property. Now called Antler Village, it houses the Biltmore Winery, an outdoor adventure center, an inn, shops, and restaurants. Most visitors stop after touring the house, but there’s another 8,000 acres beckoning just outside. Stop by the adventure center for gear and maps, or hire a guide to explore more than 20 miles of hiking and biking trails that crisscross the estate. Intermediate singletrack enters Biltmore Forest on the north end of the trail and climbs sharply to the house and gardens to the south. In between, there’s miles of wide, flat, and beginner-friendly greenway connecting the French Broad River, Antler Village, and the Inn at Biltmore Estate. Another option is a leisurely 2.5-mile stroll through the formal gardens. Start at the Italian Garden adjacent to the main house to wind your way down to the boat house and pond. Stop by the conservatory and butterfly garden, or head to the estate’s stables to explore Biltmore’s trails on one of their beginner to intermediate trail rides. The French Broad River flows wide and calm across the Biltmore Estate from Pisgah National Forest to downtown Asheville. Rent kayaks at the outdoor center for an easy, self-guided 3- to 4-mile float, or sign up for a guided raft trip, a great option for families with kids who are paddling for the first time. 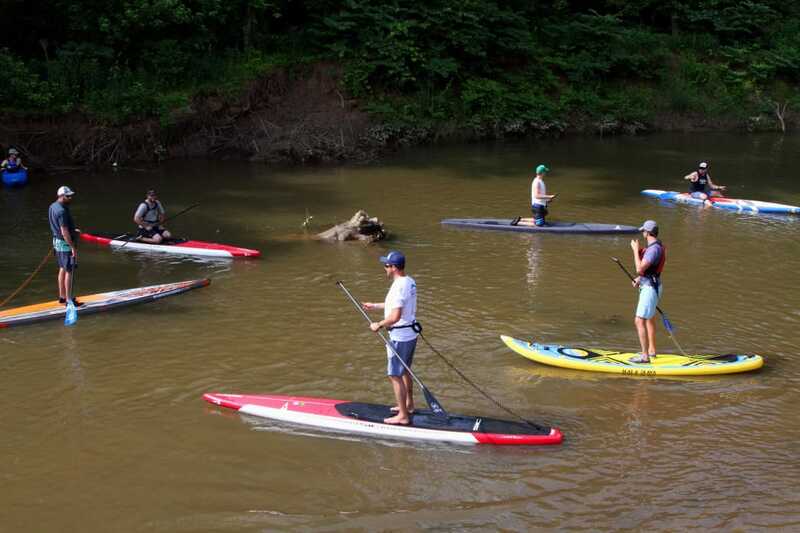 More experienced paddlers with their own kayaks and SUP boards can put in at the Bent Creek River Access near the North Carolina Arboretum for a 7-mile trip through the estate and into downtown Asheville. The French Broad is ideal for a fly-fishing lesson, where Biltmore instructors teach the basics of casting, tying knots, and picking the right fly. Lessons for all ages and skill levels run two hours to half a day, or you can go after smallmouth bass on a guided boat trip on Biltmore’s lakes and lagoons. Another option is a full-day, guided trout fishing trip on local creeks and rivers outside estate boundaries. To fit a weekend’s worth of adventure into your stay, you’ll want to book a room on site at one of Biltmore’s two hotels. For romance and luxury, spend the night at the Inn at Biltmore Estate. Book a massage at the day spa, sip cocktails while listening to live jazz in the lobby bar, and enjoy afternoon tea or an intimate candlelight dinner in the Victorian-era dining room. 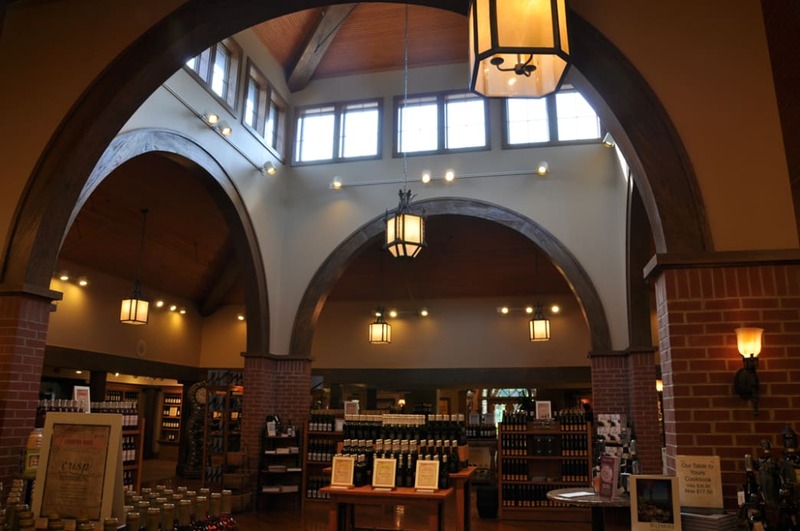 It’s a short stroll to the winery for wines, cheeses, and truffles on the behind-the-scenes Vine to Wine Tour, or to the wine bar to sample the award-winning varietals grown on 150 acres on the west side of the estate. The Village Hotel has the same gorgeous mountain views as the inn, with kid-friendly restaurants like Cedric’s Tavern and the Bistro; a petting farm with goats, chickens, horses, and sheep; and an elaborate, fairytale village playground. In addition to Antler Village shops and restaurants, there are live blacksmithing, woodworking, and beekeeping demonstrations, and carriage rides on miles of estate paths not accessible to day visitors. Finish your day with an ice cream cone at The Creamery, then stretch out on the green for live music as the stars come out.